Family outdoor adventure is something I love, but I have to admit that I was never really itching to sleep in a tent. It didn’t take me long to realize that I better re-embrace the tent camping tips of my youth if my family was going to experience wilderness areas and get away from the crowds. When I became a parent I realized that we were missing out on things if we couldn’t go tent camping and extend our ability have better experiences than day tripping allowed. I didn’t relish the thought of sleeping on the hard ground, but my desire to see and experience more motivated me to grab a tent and give it a try. Heading out for your first tent camping experience can be daunting, especially if you look at all the articles out there online. There are a lot of approaches, but in my opinion you don’t need as much than you may think to get started. Lets go through some tent camping tips. An ax for breaking up deadwood and matches. We borrowed a neighbor’s old tent for our first camping experience. Borrowing a tent is a great way to try camping and save money. When you are ready to buy a tent walking into a sporting store to look at camping tents can be overwhelming, but remember that most new tents will do a good job of keeping you dry. The costs will rise as the materials and construction become lighter and designs become easier for setup and more sturdy in high winds. Knowing what kind of camping you plan on doing can help you make those decisions as the needs of the casual camper are certainly not the needs of someone hiking in 10km before setting up camp. If you are not planning on backpack camping, lightweight and size doesn’t matter. I would go with a big camping tent when so you have more room for your gear and more space for each camper. Our borrowed tent on our first trip was not light, but it got the job done. When we knew backcountry camping was for us we decided to invest in a better tent. Buy a tent you can afford, but remember that the last thing you want to discover is that your tent is not exactly waterproof during a 3am downpour. If you are new to camping it might be a great idea to rent your tent from an outdoor retailer or outfitter; they are great resources for tent camping tips. 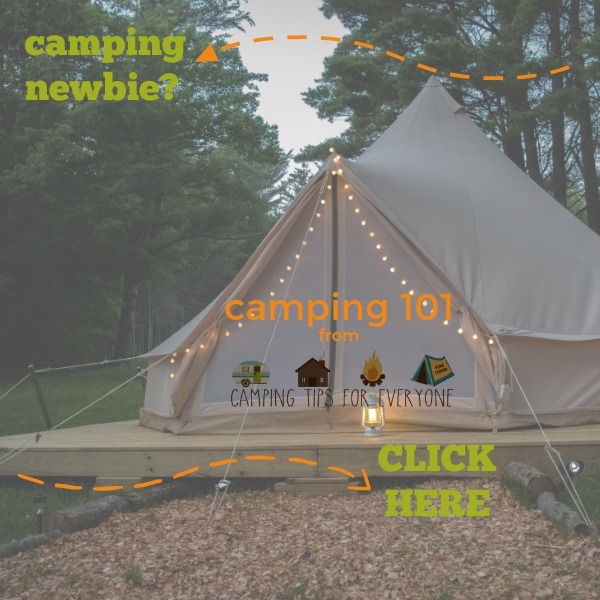 This is a great option to try out gear and make sure you enjoy tent camping before making the investment. In preparation for a backpacking trip in Norway, we chose a tent that was a blend of lighter weight, 4 person size, and highly rated waterproofing. It wasn’t the most expensive and also not the lightest, but we knew we could split the weight over 4 backpacks, making it good for family backpacking. The kind of mattress you choose is a matter of your needed comfort level vs easy packing; from simple foam pads, Thermarest and air mattress. Foam pads and Thermarest work well in a backpack but if you aren’t camping far from your vehicle, I would suggest you use a big, thick air mattress. Believe me, you will sleep better. The first time we went camping we took the bedding from our own beds, but after we knew tent camping was for us we decided to buy good sleeping bags. Sleeping bags come in different styles; rectangular, semi rectangular, or mummy bag. Mummy bags retain heat best, but people can find them restrictive at first. Sleeping bags use different insulating materials; goose down and synthetic. Synthetic is generally less expensive but heavier and harder to compress. Down is lightweight and easy to compress but often more expensive and loses insulating value when wet. Packing is completely dependent on what kind of camping you are doing. If you are backpacking it is all about being light. More casual camping in a marked site near your vehicle is easier on the back, but you still need to be organized. Separating gear in plastic bins is a great way to keep organized. A cooler full of ice is a must for all your fresh food items. When you are tent camping it is important to pay attention to safety- this includes both hygiene and safe storage of food. One important tent camping safety tip is to always make sure you keep your camp site tidy and cleared of any food items which attracts animals. Your tent should be a no food EVER zone. This even includes snacks, toothbrush, and toothpaste, which all can attract animals. Pack all food items in the car or hang it in a tree if you are backcountry. So you don’t get sick from bacteria make sure you wash your hands and keep any perishable food on ice. A good tarp can save the day as it can be used as extra shelter in rain or sun. Wet wipes make it easier to keep yourself clean when out tent camping. Headlamps are perfect so you can work with you hands. I like to bring extra plastic bags for trash, dirty clothes or waterproofing. There will probably be a picnic table at your camp site so you don’t need extra chairs and tables. We stopped packing pillows on our second trip. Embrace the sounds of nature and leave the bluetooth speakers home. On my first camping trip as an adult I spent 3 days organizing the food. Today, I go much simpler and invested in a compact camp kit with bowls, cups, pot, cutlery and room for my Primus stove and fuel. I dropped the gourmet and keep it simple and hearty. When camping in a campground with facilities you can make your menus a bit more complex. Egg, bacon and potatoes in a skillet. Foil dinner – chicken, peppers, potatoes and onion. Steak with mashed potatoes and salad. 1 red pepper sliced thin. Cut up vegetables add you protein and wrap in foil with salt and pepper. You can prepare them at home and cook them on the campfire coals. Test your gear and know it works before you go camping. Watch the weather forecast and prepare for the weather. Going backcountry? Let someone know where you are going and when you are returning. • Pot, pan, bowls, plates, cutlery, cups, kitchen knives, chopping board, aluminum foil. • Salt, pepper, fry oil, canned foods, ultra pasteurized milk, pasta, pancake mix. • Cooler for your fresh food with plenty of ice.